NASA's Juno spacecraft captured this image of Jupiter shortly after completing its 12th close flyby of the planet on April 1, 2018. NASA's Juno spacecraft will continue studying Jupiter for another three years. The $1.1 billion Juno mission has been extended through at least July 2021, NASA officials announced yesterday (June 6). The agency will fund Juno into 2022, to cover the cost of data analysis and close-out activities. Juno launched in August 2011 and arrived in orbit around the solar system's largest planet on July 4, 2016. 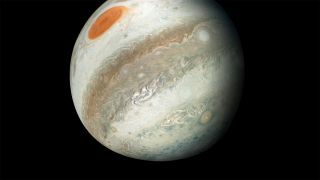 The spacecraft is studying Jupiter's gravitational and magnetic fields as well as its thick atmosphere, collecting data that should reveal key insights about how the gas giant formed and evolved. Juno makes most of its observations during its closest approaches to Jupiter, which occur once every 53 days. Juno's final science orbit was supposed to be much less elliptical, with close flybys taking place every 14 days, but an issue with a thruster valve nixed that plan. NASA's Juno spacecraft will maintain its 53-day polar orbit around Jupiter during its continued mission. This orbit takes Juno as close as 3,000 miles (5,000 kilometers) to the gas giant, and as far away as 5 million miles (8 million km). "This is great news for planetary exploration as well as for the Juno team," Juno principal investigator Scott Bolton, from the Southwest Research Institute in San Antonio, said in the same statement. "These updated plans for Juno will allow it to complete its primary science goals," he added. "As a bonus, the larger orbits allow us to further explore the far reaches of the Jovian magnetosphere — the region of space dominated by Jupiter's magnetic field — including the far magnetotail, the southern magnetosphere, and the magnetospheric boundary region called the magnetopause. We have also found Jupiter's radiation environment in this orbit to be less extreme than expected, which has been beneficial to not only our spacecraft, but our instruments and the continued quality of science data collected." Juno and its science instruments remain in good health, NASA officials said. The extension comes after an April report by an independent review panel that found the mission remains on track to accomplish its main science goals. When Juno's work is done, the probe will be de-orbited intentionally into Jupiter's thick atmosphere, to ensure that the spacecraft doesn't contaminate the potentially life-supporting Jovian moon Europa with microbes from Earth. NASA's Cassini Saturn orbiter ended its mission with the same kind of death dive last September.